The writer (as you might expect) takes the reader on a journey through Ieva’s life, but backwards. As we meet the important people in her life – her gran, her mum and dad, her brother, Pāvils, and her daughter, Monta – things begin to take shape. The story always returns to two other people though – her dead lover, Aksels, and her ex-husband Andrejs – two men forever linked by one woman and a fateful event. Once you have an overview of the whole novel, it can be seen as a work (and life) in three parts, with Ieva’s life changed by two pivotal events: Aksel’s death and her final rejection of Andrejs. Ieva passes from young love and freedom, through a miserable existence chained to a jailbird, followed by a life as an artist – although the novel’s structure turns that order on its head. Are you still with me? The strained relationships the main character has, both with the two men in her life and her parents, has a wearing-down effect on Ieva and causes a rift in her relationship with her daughter, Monta. In fact, some of the more interesting parts of the book are when we see Ieva through the eyes of the other characters. She’s a middle-aged woman sleeping around, working her way through… what exactly? Grief? Trauma? Depression? 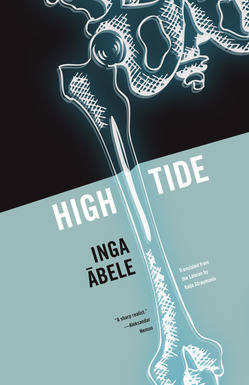 High Tide is beautifully written in parts, and the writer often plays with the imagery of tides, high and low, usually metaphorically. In seizing opportunities when they come, the characters are battling through the tough, low-tide times, waiting for the tide to turn in their favour. There’s also a tide-like contrast in the structure between frequent short sections, extended conversations and the few, pivotal, lengthy prose sections. These long quasi-monologues (for example, a section at the start of the novel with Ieva and Andrejs at the flat) are long, pensive and elegantly written, and are probably the parts I enjoyed the most. I just did a critique of the translation of this book for ALTA, and it is dreadful. Words are egregiously mistranslated, phrases are 'interpreted' rather than translated. The reason that “some of the shorter parts were a little clumsy, especially in conversations” is that dialogue is often embedded in text. Paragraph breaks do not follow the original – and if they're not going to, why not break up the voluminous blocks of text more? I don't believe an editor ever looked at this translation; Kaija Strautmanis apparently bought herself a job at Open Letters with the $7,000 she was paid for doing it. I have my doubts whether it was proofread either, or the style problems would have been caught. Inara – As I don't speak Latvian, I'm not going to argue about particular translations. In terms of how well it came over in English, I'd say it was an OK translation, nothing special, but not especially jarring either. However, claiming that the translator 'bought herself a job' is out of order, and I suggest you think carefully before throwing more statements like that around. I see no evidence that an editor ever looked at this manuscript, including to accept it for Open Letters. Kaija Straumanis doesn’t have the English skills to translate – she seems to think that translation is paraphrasing the original, without bothering to be accurate. She can’t have proofread her manuscript, or she would have caught at least some of the mistakes and words left out. What qualifications can she have to be editor? If she brought this book over to Open Letters and said hey, I have $7,000 to support publishing this book but I want to be editor, it’s actually self-published.